Erin Fitzhugh Gregory, originally from the Mobile/Fairhope, Alabama area, has lived in her husband Tim's hometown of Columbus, Georgia since 2002. ​They have two young daughters, McCall and Lizzie. Erin paints in acrylic and occasionally in oil almost daily in her home studio. Erin has been fascinated by art as far back as she can remember. As a child, art was always the highlight of the school day. She knew from an early age that she would be an artist when she grew up. Upon graduating from Auburn University with a BFA in painting in 2000, the reality of being a full-time painter was a bit intimidating. After her first solo show at the Lyon's Share Gallery in Fairhope, Alabama in 2001, she realized painting could actually become her career. In Erin's fifteen-plus years of painting, she has had numerous solo shows and has participated in many group exhibitions. Erin proudly sells her work through some of the finest galleries in the Southeast. Erin has received numerous awards for her art and has been featured on many blogs and in a variety of magazines. 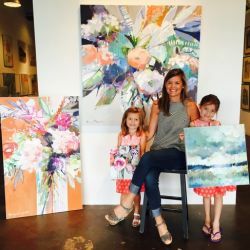 For many years, Erin has done commissioned work and has taught workshops, but for now is taking a hiatus from those ventures and is putting all of her efforts into raising her family and into creating the best, most authentic artwork she can. Her best advice for aspiring artists is to simply paint often and not fear mistakes. Mistakes in painting, especially in oils and acrylics, can often be cultivated into something beautiful in the end. Discipline and perseverance are key! Erin views each day as an adventure and a blessing! Being an artist never loses its appeal and continues to be such a fulfilling and exciting process. Painting five days a week for almost two decades has helped Erin make a lot of discoveries and hone her painting style. Her focus has always been on emphasizing contrast and variety within the composition while vividly capturing the light and color of her subject, whether it be in a still life, a landscape, a figurative piece or even the occasional abstract.